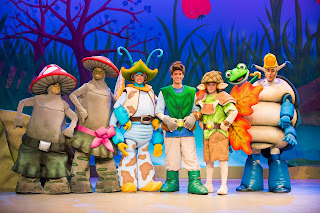 Join hero Tree Fu Tom, as he takes to the stage in his first ever nationwide ‘live’ tour in 2015. With dates in theatres across the UK, running through to November 2015, fans of the CBeebies show will be able to follow the adventures of Tom, Twigs and friends on an action-packed adventure through the magical world of Treetopolis! Follow Tom, Twigs and friends on an action packed adventure through the magical world of Treetopolis! After finding a dusty old treasure map, Tom decides to follow it and see where it leads - but it’s not an easy route! Tom and his friends must travel through wild weather and stop the mischievous Mushas who are making trouble. Will Tom save the day? Will he find the treasure? What will the treasure be? Come along and find out! Be part of the Magic! To book tickets for a show near you, please follow this link.